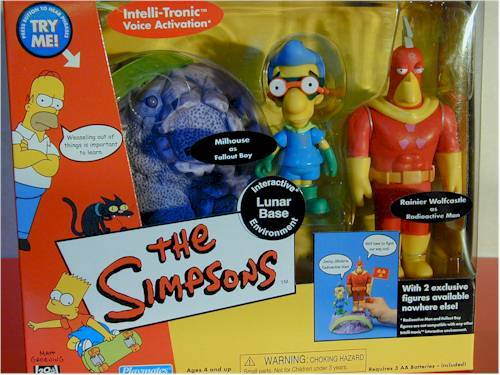 As I scurried from Burger King to Burger King today trying to find more of the Halloween Simpsons kid's meal toys, I found myself amazed at the amount of Simpsons product smacking us in the face this month. 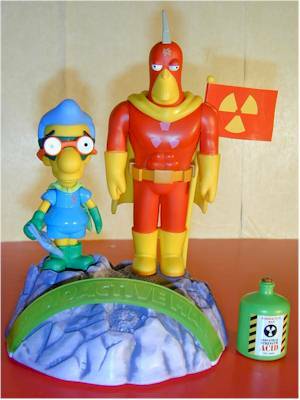 Here we have another playset, the Lunar Base with Radioactive Man and Fallout Boy, also known as Ranier Wolfcastle and Milhouse. This playset is a shared exclusive between Diamond and Electronics Boutique. I bought mine from EB on-line, and actually ordered this puppy last March. How time flies. 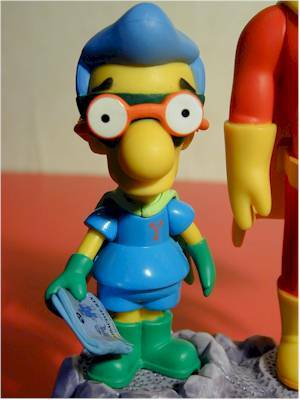 You can expect these to be suggested retail of $30 at most places, and some comic shops may charge more. 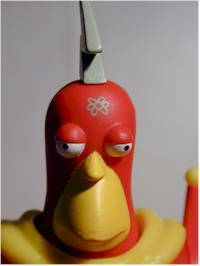 I must have used my prognostication skills last week when I mistakenly thought the new Treehouse of Horror box was smaller than last years - I had it right, just the wrong exclusive playset. This one is much smaller, although the box style is similar. Both of these figures are dead on. 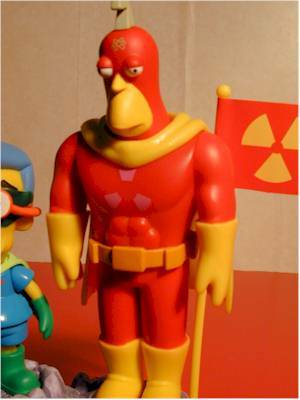 Excellent work on Radioactive Man, and I don't mind the lack of an 'action pose'. Let's face it, no other WOS figure has had one, so if they had gone that route with RM, he would have looked completely out of place with the rest of your display. The sculpting has some nice touches too. 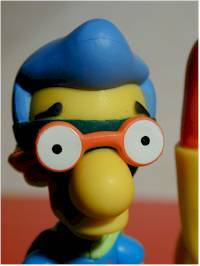 Milhouse has his squinty eyes under his glasses again - they did this with the original as well - but this time they are painted too. The texture of the moon base is nicely done, and they gave both figures plenty of space to stand. No problems with the paint ops on my set, and these are more complex than the average WOS figure. Red and Yellow always pose a problem, and bleeding from one to the other is common. But they don't have an issue there, and the wash details on the base are excellent. Also of note is the fine detail on the emblems on both figures. These are painted on, rather than stickers. Thank goodness, or thank Playmates, because we certainly don't want to see another KK Bart debacle. Did you catch the premiere of Bob Patterson this week? It has possibilities, and was quite a bit better than that awful Michael Richards vehicle last year...then again, that's not saying too much. Oh, and they have the usual 4 points - neck, shoulders and waist. There are really three accessories here - the flag, bottle of acid, and script. Of the three, the bottle of acid is the best. It's an original accessory, with a terrific label. The flag looks fine, although the cheap paper isn't as nice as I'd hoped. Compare it to the American flag that came with the school, and you'll see what I mean. And yes, the script looks like a comic book. That's because it's the comic accessory with a different label. That's not a big problem, but considering the cost of this set, I think we deserved better. Since only these two figures work with this playset, I'd have thought we'd get more lines. RM has four, FB has three. Between the two, the have less than Kang. Perhaps it's just that there wasn't much to choose from, but at least a couple more lines would have been nice. This set is $30 - a regular set is $20, and THOH2 was $35. This 'playset' is about half the size of a regular set with no walls, has far fewer lines, is short on new accessories, and only has two figures. Considering all that, this set shouldn't cost more than $20. Okay, perhaps I was a little harsh the other day when I said this set 'bites'. It's not that bad, but as a playset it's my least favorite of the entire series so far. The figures are great, don't get me wrong. But the playset just seems out of place with the others, and it certainly isn't worth the high cost. If I were going to skip something (yes, I'm a completist sucker), I'd skip this one.